Following days of intense public and media pressure, Spain’s governing Popular Party finally announced that it will investigate the financial activities of former treasurer, Luís Bárcenas, who the national court (La Audiencia Nacional) allege has accumulated an unexplained €22 million in Swiss bank accounts. On top of this, media reports state that during Bárcenas’ time as treasurer he paid members of the party undercover monthly payments ranging from €5,000 to €15,000, a practice that occurred from 1989 to 2009. This money allegedly came from commissions paid by security companies and construction developers to the Popular Party in return for public contracts and work at the party´s offices acrossSpain. 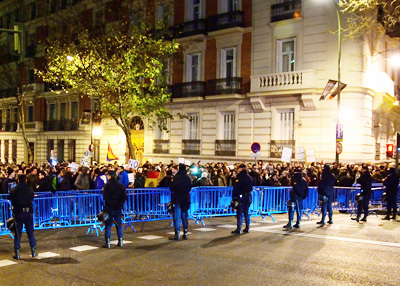 Protest in front of the Popular Party’s headquarters in Madrid. The Bárcenas investigation is yet another part of the Gürtel scandal – an ongoing political corruption case in Spain involving members of the Popular Party. Bribery, money laundering and tax evasion are among the allegations made against elite businesspeople and politicians connected to the party. This latest scandal proves the urgent need for reforms, particularly in the transparency in financial accounting of political parties. It’s something that was a key recommendation in a 2012 study, so in some respects the scandal should not have been a surprise. Given the mood in Spain, where unemployment is depressingly high and the economy shrinking, it was also not surprising to see the people taking the streets in Barcelona and Madrid after the news broke. The Popular Party spokesperson, Maria Dolores de Cospedal, said: “Information that is appearing these days can cause a scandal and is so serious that our party has to be exemplary and has to react. Therefore, we will have to go over everything we have done to prove to all Spaniards that our hands are clean.” Prior to the announcement, the main representatives of the right wing Popular Party had denied any involvement with the Barcenas case and especially, they rejected any accusations to receive illicit funding for themselves and their party. Clearly Spanish political parties need to be more accountable towards the public opinion and they have to disclose properly their funding and how they spend it. It is important that this is not only related to the case of Spain, in fact political parties financing is one of the major weaknesses in European countries as identified by the ENIS regional report. In most of the European countries, political party financing is a particularly high risk area for corruption; even countries often described as having ‘low corruption contexts’ have not managed to insulate themselves against the risk. Disclosures of the funding and expenditures can support political parties to establish a more transparent system that will help to restore citizens’ trust on them and to decrease cases of corruption. In Spain political parties receive more than 90 per cent of funding from the State. The strength of such a system is that by relying primarily on public funds, parties can operate more independently and remain detached from private funders’ agenda. However, the parties have over time indebted themselves and used bank loans to cover additional expenses. While banks increasingly became an important source of funding, there have been cases in which banks without clear reasoning remitted debts. This fact suggests an excessive reliance on actors in the financial sector. Moreover, the public’s opinion of the sector is one of distrust. A 2010 survey indicates that citizens perceive that political parties are the institution most affected by corruption. As indicated above, political party financing is an internationally recognised problem and Article 7 of the UN Convention against Corruption calls on government to enhance transparency in the funding of political parties and candidates for elected public office. Some European countries have taken steps to regulate political party and campaign financing by introducing laws on disclosure of finances; some countries have banned certain types of donations; others have reduced the need for private money by providing state subsidies and so on. Also, the newly proposed Law on Transparency, Access to Information and Good Governance in Spain is an excellent opportunity for political parties to show commitment in the fight against corruption. In the proposal the law would be subject to public institutions, this way excluding political parties. Should political parties voluntarily place themselves under the scrutiny of the newly proposed law, a strong message of accountability would be sent to the public. It’s interesting to note that one of the main recommendations of the Group of States against Corruption (GRECO) is to modify rules on political party financing in Spain, including the requirements to parties to publish their accounts in details, which are timely and easily understood by voters. A new Law on Party Financing that passed in October 2012 represents an improvement in the regulation addressing some significant gaps with regard to transparency and accountability of the Spanish political parties. However, it’s necessary to see if the implementation will be effective. The next GRECO assessment for Spain is due in 2013, thus the need to actively implement new regulations should be a priority for the Spanish authorities. A more clear and transparent system for political party financing is absolutely necessary to strengthen transparency and accountability and in effect – bolster the fight against corruption.